This Portland, Oregon born, award-winning bass-baritone has amassed a wonderful list of accolades and successes in the last decade singing leading roles with the major orchestras and opera companies of the world under the baton of conductors including James Levine, Seiji Ozawa, Micheal Tilson Thomas, Charles Dutoit, Robert Shaw, Gerard Schwarz, Jeffery Tate, Jesus Lopez-Cobos and Christophe von Dohnanyi. His imposing stage presence and magnificent voice have electrified audiences in Europe, New Zealand, North and South America, Korea and Japan. Highlights of the past few seasons include Mahler 8th Symphony (recording), Missa Solemnis, Mozart requiem, and Beethoven 9th (recording) with the Seattle Symphony, Gerard Schwarz conducting, Les Troyens with Boston Symphony and at Tanglewood with James Levine, Oedipus Rex with the Boston Symphony under the direction of von Dohnanyi, Walküre Wotan with Scottish Opera, Walküre Wotan (cover) on the MET tour of Japan, Sachs (cover) in Die Meistersinger von Nürnburg at the MET, and the American Premier of the opera Sophie's Choice by Nicholas Maw at the Washington Opera. Mr. Brainerd has also made his debut at the Paris Opera (Bastille) in La Damnation de Faust with Seiji Ozawa on the podium, a debut in Madrid singing the title role in performances of a newly discovered opera Merlin by Isaac Albeniz, Wotan in Die Walküre with the New Orleans Opera and performances of Messiah at Carnegie Hall. 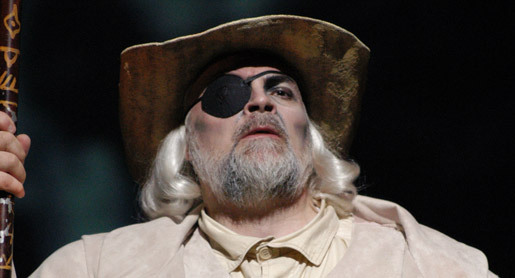 Mr. Brainerd replaced James Morris as Wotan in Die Walküre performances at Teatro Colon in Buenos Aires, performances and recorded The Dream of the Peasant Grishko by Mussorgsky with the New Jersey Symphony under the baton of Zdenek Macal. Mr. Brainerd has sung Kurvenal in a performances and recording of Tristan und Isolde at Carnegie hall with the Opera Orchestra of New York and Scarpia in Tosca with Teatro Arriaga in Bilbao, Spain. He also debuted with the New Zealand Symphony as Wotan in five concert performances of Wagner's Das Rheingold - a role in which he won critical acclaim with the Arizona Opera Ring Cycle. Mr. Brainerd sang Golaud in Pellèas et Mèlisande in Japan with The New Japan Philharmonic under the auspices of Seiji Ozawa. Also with Ozawa, were performances of Madama Butterfly with the Boston Symphony and Damnation of Faust with Ozawa at the Saito Kinen Festival in Japan. Mr. Brainerd's versatility encompasses not only the Wagnerian repertoire of Wotan and Gunther in The Ring and the title roles in Die Meistersinger von Nürnberg, but also many roles in the Italian and French operatic repertoire, including Scarpia in Tosca, Falstaff, Commendatore in Don Giovanni, Villains in Hoffman, Golaud in Pellèas et Mèlisande and Mephistopheles in The Damnation of Faust. Mr. Brainerd is also in great demand as a concert artist throughout the world singing a vast repertoire from the Baroque to Modern!